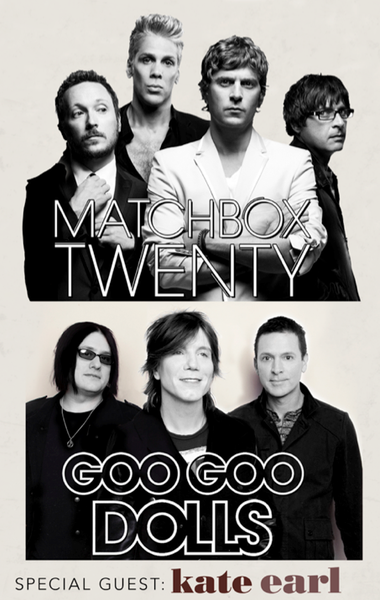 A little while back we asked YOU - Matchbox Twenty's biggest fans - to submit your concert review from the show you attend on the Matchbox Twenty/Goo Goo Dolls Summer Tour. Each of you won a copy of NORTH autographed by all the members of Matchbox Twenty! Plus you were each rewarded 500 points to use in the community. Expect your prizes in the mail soon. This is an ongoing contest, so check out the next phase here. 3 entrants will be chosen to win an autographed Matchbox Twenty New Years Day poster. When I first heard that Matchbox Twenty and Goo Goo Dolls were going on tour together, I knew I had to find a way to go even though I live in Hawaii. I must've done something right because for my birthday, my boyfriend surprised me with tickets to the July 21 show in Paso Robles! Since we live in Hawaii, we saved and planned a trip to California for the concert. People thought we were crazy to travel all that way just for a show. The Goo Goo Dolls have been a long-time favorite of mine as well and we were lucky enough to meet the band prior to the show. As they went on first, I thought they put on a fantastic show playing all the old favorites. And then Matchbox Twenty took the stage. I was hoping that they would open with 'Parade' and they did! Everyone in the band rocked with their energy and their musicality. Rob Thomas was very gracious and thanking the fans for supporting them (and the Goo Goo Dolls whom he referred to as their brothers) all this time. The one song that touched me the most was 'Back 2 Good.' It was an unexpected pleasure when I heard it at my first MB20 concert 10 years ago. It then became one of my favorite songs. I couldn't believe when they started playing it halfway through the concert. It was such a pleasure to hear it live once more. It was great to be surrounded by fans, both young and old. To my left was a man in his 50s, to my right was a boy who was not yet a teenager, and me, a 30 year old girl from Hawaii getting to see her favorite band perform an amazing show once more. Thank you to Matchbox Twenty for continuing to put out great music and great shows! Fan of Matchbox Twenty since the beginning, saw them in Indy, back in the day when it was called Dear Creek. Somewhere along the way and three kids later, they still continued to be my favorite band, every CD, pop in and let it play, story after story being sang, feeling the passion that they had for their music, never got old for me. This year was going to be my year to hear and feel that passion live. I was able to see them in three times so far!!! This summer, I got to meet new friends in Cincinatti and in Indy. Every show filled with so many great memories, never a disappointment!! Hearing the first few chords of each song that MB20 sang, knowing in your heart what song it was going to be before the words were spoken and thinking to yourself how lucky you felt to hear each one of the songs in person, singing along or even just watching the guys perform every song, every time with passion, like it could be the last. Never have I heard or seen a group perform like they do. Playing off of each others strengths and always pushing themselves to the next level of greatness. They truly are Remarkable!! Thank you Matchbox Twenty, Rob, Kyle, Brian, Paul, Matt and Stacy for giving us your time over the years and your never failing mad skills to bring your thoughts and emotions to each song, your music is so very often on my mind, but it will forever be in my heart. Went to the Indy show last night. I have yet to miss a concert of MB20 when they come here and last nights show was the best yet. A bit bitter sweet as I have always gone with my best friend whom passed away a couple years ago. He was such a big fan and I know he is traveling with you guys to every show now. Thank you for the great performance and I look forward to seeing you again in the future!! You guys ROCK!!! Any opportunity to see Matchbox Twenty live is always going to be thrilling. Then you add in the Goo Goo Dolls as co-headliners and I can’t imagine how it could get better. Oh, but wait, did I mention there is this amazingly talented and inspiring woman with a striking voice and look that is opening for them? No? Well there is, and her name is Kate Earl. If you haven’t heard of her, don’t worry, you will very soon. She is surely going to take the music industry by storm with her passionate, heartfelt lyrics inspired by her life experiences that so many can relate to. I had the pleasure of catching this amazing #MB20GoosTour in Pittsburgh, PA which was all the more exciting, as seeing Paul Doucette perform in his hometown was awe inspiring. But let’s go in order, and we’ll get back to Paul. The opening performance by Kate Earl was fantastic. It was clear that she was exactly where she belonged, on a stage, in front of thousands, pouring out her soul to us all. It’s great to see young artists that have truly found their calling, and are able to write in a manner so that fans can truly relate to the songs. That’s exactly what music should be. An expression of the writer, but also be open to interpretation by the listener to allow a connection with the song, regardless of who is listening. I cannot wait to hear what she will do in the years to come. The Goo Goo Dolls took the stage following a brief intermission. I must admit, on a hot summer day at an outdoor venue, the intermissions were greatly appreciated, providing the opportunity to get a refreshing cold beverage (I somehow suspect they were planned more for stage prep, and less for my own personal comfort, but as usual…it’s all about me, in my head). I was definitely looking forward to this performance, having been a fan for most of my life but never having seen them live. The digital lyric board above the stage was fantastic during the new single, Come To Me. It allowed for everyone to join in and sing along even though everyone didn’t know every word off the top of their head. Brilliant! Flashback to high school with Black Balloon, which is always fun, and I absolutely loved how they engaged the fans with all the black balloons floating throughout the venue! Johnny Rzeznik was all over the stage and as I’m sure you can imagine, had the fans going crazy for him! The new album is great, and in my opinion has a whole new vibe for the Goos which I really dig and was excited to hear live. Again, out of respect for my own personal comfort I’m sure, there was a brief intermission where they also switched sets for Matchbox Twenty. If you think that the digital lyrics for the Goo Goo Dolls sounds innovative and exciting, you cannot even begin to imagine how amazing the stage looked for Matchbox Twenty. Three gigantic cubes, displaying live footage from the stage, as well as video and lyrics throughout the show, wild lights and illuminated risers for the instruments. The stage alone was worth the cost of the ticket, and then you get the most unbelievable performance on top of it all! These guys have figured out exactly what their fans are looking for, and they never cease to deliver. Their songs have always been the soundtrack to so many peoples’ lives, and they always pour the same energy and passion into performing as they do into writing. At no other show have I ever felt like the band actually knew I, personally, was there (and I realize they probably don’t either, but they sure make me feel like they do). Always looking fans in the eye, singing directly to people in the crowd, talking to everyone between songs as though we are all just hanging out with them on a Saturday night. The opening song, Parade, from the newest album “North” sets the tone and is a great lead in to a very exciting 2 hours of sheer amazement that ended with a 3 song encore, including one of the long-time fan favorites “Push”. Now, as I mentioned before, this was Matchbox Twenty performing in Paul Doucette’s hometown. If you’ve ever seen Paul on stage, you know that the man spewing with energy. It is nearly impossible, I have determined, to get a decent picture of him performing because he does not hold still for even a second! That night, in Pittsburgh, what I thought was impossible happened and his energy was amplified to a level I could not even imagine. The strong, barely controllable emotion that he emits on the stage is simply amazing. What he gave on that stage on June 29th, what they all gave to us, I can only hope they felt was properly repaid with a crowd of thousands of fans screaming at the top of their lungs, loving every second and being left, as always wanting more. Coming from someone who has been to many concerts by many artists of many genres over the years, I hope it means something when I say that Matchbox Twenty has always been the best live performance I have ever seen, being outdone only by themselves with each additional show I am blessed to attend.